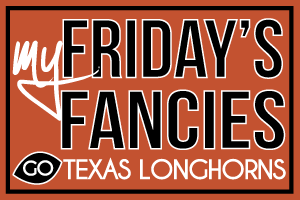 Hey Love: My Friday's Fancies! Longhorn Football Frenzy! I'm in LOVE with that bag!!! what a cute outfit! love those boots! i love that whole outfit!!! soooo cute!! Love all the leather and brown textures in this. Very fall (and perfect for football)! Love that outfit. Your style is pretty cool. Oooo great way to transistion white into the fall :) Well done! Love the combination of the simple white shirt with the brown accessories and boots. Perfect for fall and football! I love the bag and the boots! Well, I wish loads of success for the team! And a great weekend for you! It was great getting to know your blog, will read the other posts now! Great choice of items, they look so luxe and sophisticated, love the bag and boots, I can see myself wearing them! All the best for your team! I like your wishlist :) So cute! I love your picks and burnt orange makes me reminisce college so much! !